← Best of Houzz 2017 Award Winners! For those of you who have not already heard of LivingKitchen, it is one of the kitchen industry’s biggest events of the year whereby over 200 national and international suppliers from across 21 countries come together to present their latest ideas and innovations. This year, the fair was held in Cologne, Germany, and LivingKitchen – The International Kitchen Show partnered forces with Imm Cologne – a leading Global furniture fair which highlights the very latest interior design trends from around the world. More than 150,000 visitors came to experience all trends related to the kitchen and we were lucky enough to be given an exclusive invitation to visit the fair from our appliance partner, Miele. 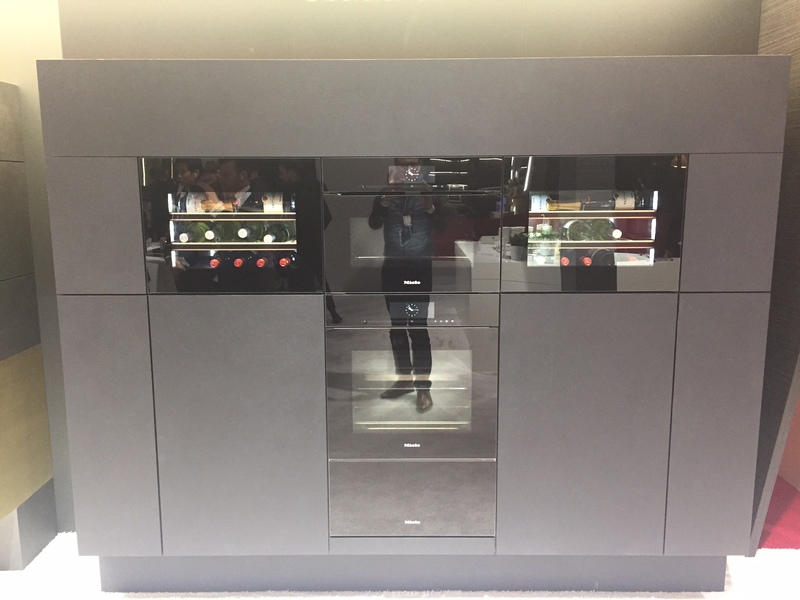 Andy Barette, Senior Designer for the McCarron & Co Chelsea showroom, reports back on his experience and gives us the lowdown on some of the year’s most exciting new launches from Miele. 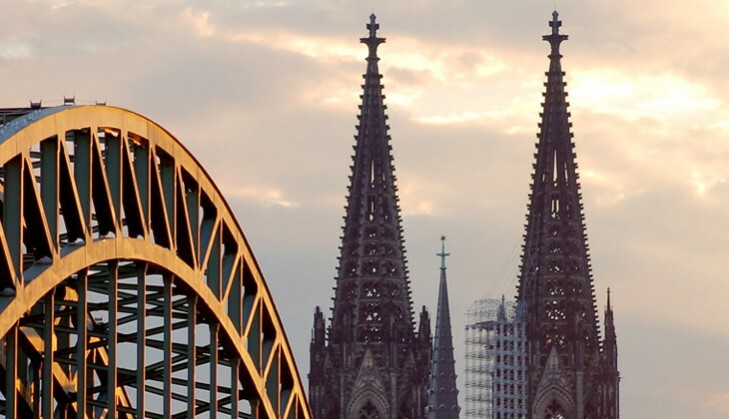 “This January saw the bi-annual international interiors show back at Cologne. Fortunate enough to be taken by our trade partner Miele, I was able to enjoy the show with the benefit of having a detailed tour of the Miele stand. There are certainly a number of exciting products to look out for this year, with one stand out trend- combined hob and downdraft solutions. There are some very exciting appliances on the way and with a re-vamped range of combi sets, the home chef will never have it so good! 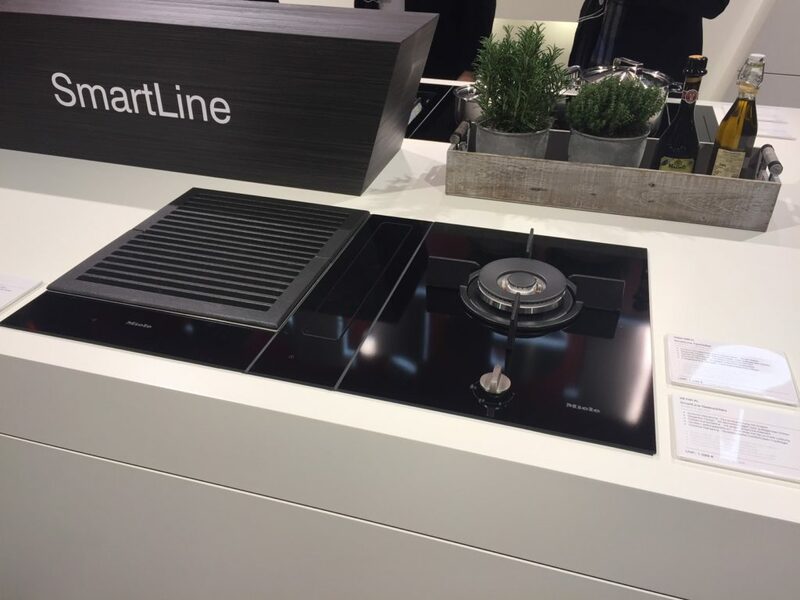 The stand out for me was the new Smartline range of combi-sets (Individual hobs that can be selected to create a tailored cooking area). The combination I loved was the grill and single burner, but the real magic comes from what lies inside the central flat section between the 2 hobs. Simply touch the sleek gloss black cover to remove it and reveal a smart new downdraft extractor that is powerful enough to cater for both griddle and single gas burner cooking. A sceptic of downdraft extraction in the past, I was keen to have the demonstration convince me that the unit was powerful enough to remove the kind of cooking fumes that you would expect to be created from this type of cooking, and I have to say that I was not disappointed! It may be sad to admit, but I found it deeply satisfying watching the fumes get drawn horizontally across the pan before disappearing into the downdraft. It gets better too- the system can be externally ducted, or, with seemingly no affect to productivity, recirculated, with a charcoal filter being located in the kick space under the furniture. I learnt that these charcoal filters can be baked off in the oven for up to 3 times, to extend their use to 3 years! The grease filters located in the main unit can be put in the dishwasher for ultimate ease of cleaning. Talking of dishwashers, there are some dramatic improvements coming here too, with Miele creating a quick wash cycle on a machine that boasts a best ever economy rating. Other improvements see some clever storage solutions, especially for protecting your precious wine glasses! I think the jewel in the Miele crown for this year though will be the introduction of their stunning range cookers. 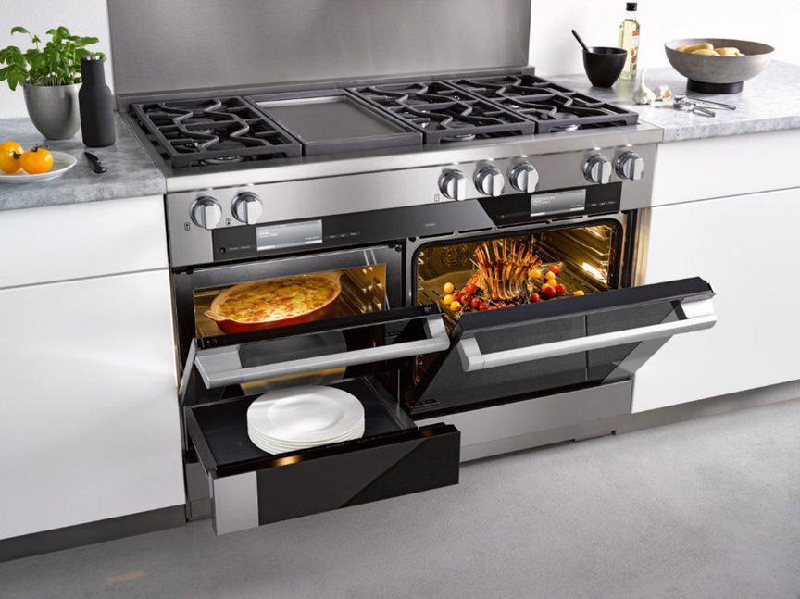 Aesthetically beautiful and incredibly practical, with M touch oven style touch controls, the option of a single oven/ combination oven and warming drawer is sure to be very attractive proposition. There will be a range of sizes available to the UK market, with a large capacity 900mm wide single oven also likely to be popular. Miele have created a modern stainless steel canopy to be paired with the range, which adds to the semi commercial look. Miele have also invested in a new range labelled ‘Artline’ available in a number of finishes and with the M touch style controls, the handless design will appeal greatly, especially with contemporary styled kitchens. 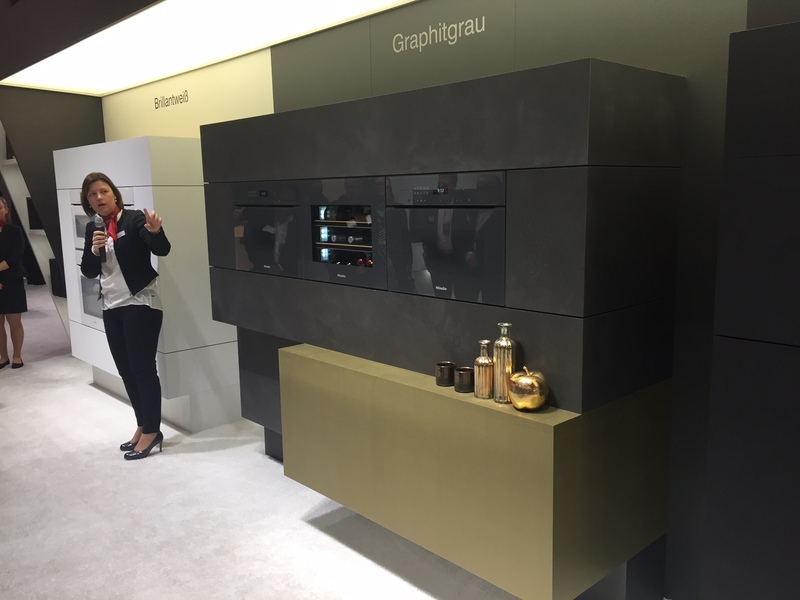 I particularly liked the configuration with single oven/ steamer with warming drawer and flanked with integrated wine coolers to create a visually impressive T shape of dream appliances. If you would like more information or to discuss any of the appliances featured, contact us at enq@mccarronandco.com. The full Miele range of appliances can be found online at www.miele.co.uk.